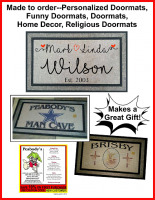 Custom made personalized Door Mat - Peabody's, Printing, Airbrush and Gift Shop, LLC. 18" x 30" rectangular polyester and outdoor vinyl door mat for exterior use. The mat is 9/16 of an inch thick. All mats are rolled up tight for the most cost effective way to ship. When your package arrives, unwrap the mat and lay flat so it can settle back to its original shape. All doormats are dye imprinted with special heat set permanent dye. This is industrial grade dye that is made for low light (not direct sun exposure) outdoor use. Please keep in mind this is a dye imprinted item is custom made to order, therefore processing time is currently about 1 or 2 weeks. All mats are shipped through USPS and a tracking number is provided. ** Custom made personalized outside Border Door mat. Size 18 x 30. Personalization area 13 x 19. MGB is not responsible for lost or stolen packages. Once the item is shipped, MGB has no control over the USPS deliveries. Tracking numbers are provided. Please make sure you enter your correct shipping address when you purchase your item. If the mat is shipped to the wrong address, or if it is returned to me due to insufficient address, the shipping can not be refunded and MGB will not pay to have it reshipped. Please inquire if you have any questions regarding this. 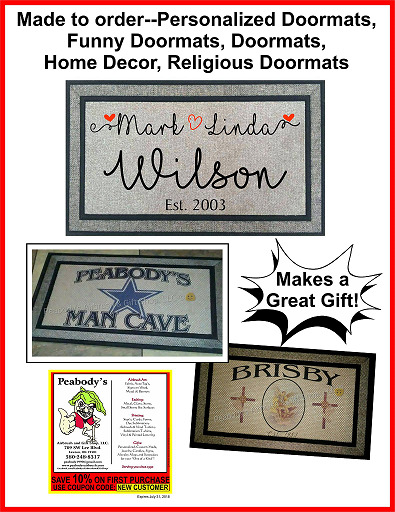 It is my pleasure to do your custom personalized door mat order in total FULL COLOR!